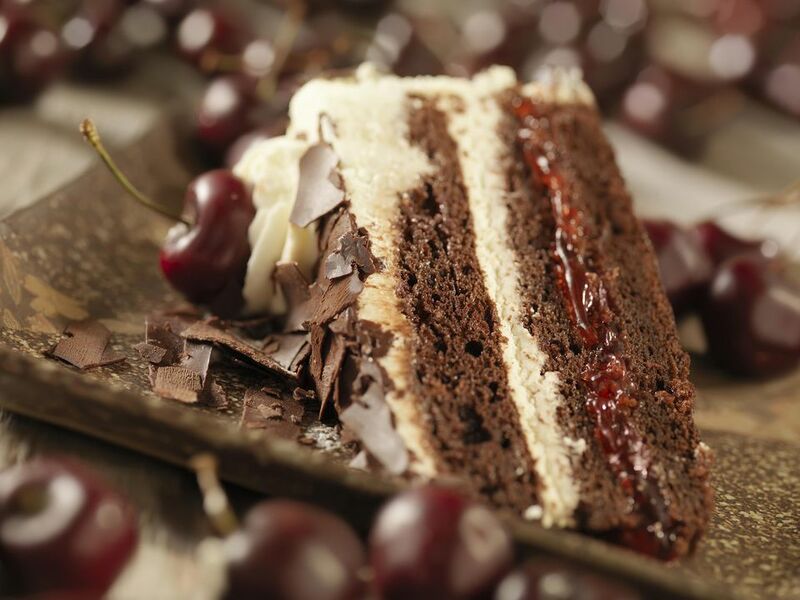 The Black Forest Cake originated in the Black Forest region of Germany. There are many versions of this cake. All of the cakes are made with chocolate, cherries and lots of cream. The very easy versions of this cake are made with a cake mix cake, cherry pie filling and whipped topping. There are also versions that everything is made from scratch. None of the versions are terribly difficult to make. This version uses everything from scratch, but it may not be as time intensive as some other from-scratch versions. Grease and flour two 9-inch round cake pans. Preheat the oven to 350 degrees F.
Combine the first flour, baking soda and salt with a wire whisk. Set the mixture aside. In a microwavable container melt the chocolate with the water. Microwave for 1 minute and check the chocolate. If is not melted, continue microwaving it for 10 seconds at a time. Set the mixture aside. In a large mixing bowl, cream the butter and the sugar. Add the eggs one at a time and mix. Add the vanilla and mix. Pour in the chocolate a little at a time and mix. Combine completely. Add the flour mixture alternately with the milk until all is used. Pour the batter into the prepared pans. Bake for 27 to 35 minutes until tested with a toothpick and cake has pulled away from the pans. Remove the cakes from the oven. Even pour 1/4 cup of kirsch over each cake layer. Allow the cake to rest in pans for 2 minutes. Remove the cakes from the pans on to wire baking racks. Allow the cake to completely cool before assembling the dessert. Drain can of cherries into a small pot. Set the cherries aside. Stir in the cornstarch until well mixed. Bring the juice to a boil. Simmer for 2 minutes until thickened. Remove from the heat. Stir in 2 tablespoons cherry brandy (kirsch). Add the cherries. Allow the cherries to cool while making the whipped cream frosting. Soak plain gelatin in cold kirsch or water for 5 minutes. Dissolve by placing it in top of double boiler over simmering water. Whip the cream until it’s barely stiff. Add melted gelatin all at once to the cream during whipping. Stop whipping when cream forms soft peaks. Place the bottom cake layer on a serving plate. Spoon the cherry filling over the bottom layer. Spoon 1 cup of whipped cream over the cherries. Place the remaining cake layer on top of the whipped creamed layer. Use one half of the remaining whipped cream to frost the top of the cake. Put the rest on the sides of the cake. Place the cake into the refrigerator. While the cake is resting in the refrigerator, use a vegetable peeler to scrape chocolate bars to make chocolate curls. If your hands get too warm the chocolate may melt. Stop and rinse your hands in cool water. Dry them and continue on making chocolate curls. Remove the cake from the refrigerator. Cover the entire cake with chocolate curls. Alternating with flavors and/or colors. Place the stemmed cherries evenly around the top edge of the cake.